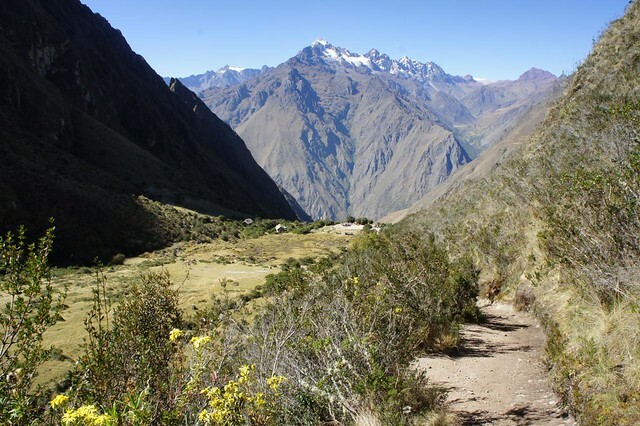 The Inca Trail is one of those iconic treks that I have always wanted to do. I managed to miss South America completely on my first round the world trip, so when I was given the chance to go to Peru for Tourdust, I jumped at the chance. The opportunity of trekking through the Andean Mountains for three days culminating in a sunrise arrival at Machu Picchu was something I could never refuse. So, I booked my ticket, dusted off my backpack and headed off to the Southern Hemisphere. Even seasoned travellers are not immune to the horror stories of acclimatisation and instant doom when they fly into altitude from sea level. As the plane started its descent amongst the mountains into Cusco, I wondered whether I would survive long enough to find out whether my brand new hiking boots would give me blisters. To my surprise and delight, I made it to my guesthouse in Cusco and despite being ridiculously out of breath every time I attempted to climb upstairs and a dull headache, I was in pretty good shape. I followed acclimatisation instructions to the letter, drank copious amounts of coca tea and rested, almost obsessively, for the first 24 hours. I met with my guide for the pre-trek briefing. He was lovely, with smiling eyes he reassured me that the symptoms of altitude sickness would pass and that trekkers with a good level of fitness had no problems once they were off trekking. At the back of mind I couldn't help the nagging of self-doubt that was creeping through me. Was now the moment to admit that I had done absolutely no trip preparation and the last time I did any regular exercise was as a student running to catch last orders at the pub. I decided to keep schtum and nodded sagely. The first morning of the trek was a painfully early start. I had what would be the last shower for several days, donned my hiking boots and waited for the pick up. We were transferred by bus to the starting point of the trek and met with our guide and porters. There were 10 of us trekking altogether we smiled nervously at each other. My fellow trekkers were, for the most part, a good 10 years younger than me. I felt old and out of shape. With dread building inside me I wondered what I had let myself in for and why on earth I hadn't done this in my backpacking days. There was no time for self-doubt, however, as we started off walking towards the check point and the beginning of the trail. The first five minute of the trek were some of the most surprising of my life. We crossed the bridge and started walking up what looked like a steep incline. Actually, compared with what was to come, it was a very medium incline. I positioned myself at the back of the group and panted as I walked. As I reached the top, everyone else was in the same shape as me. There was almost a communal sigh of relief as we realised that we were all in the same boat. For the rest of the day, we trekked together, introducing ourselves and sussing each other out. Every now and then I would stop and look around me. The scenery was breath-taking. 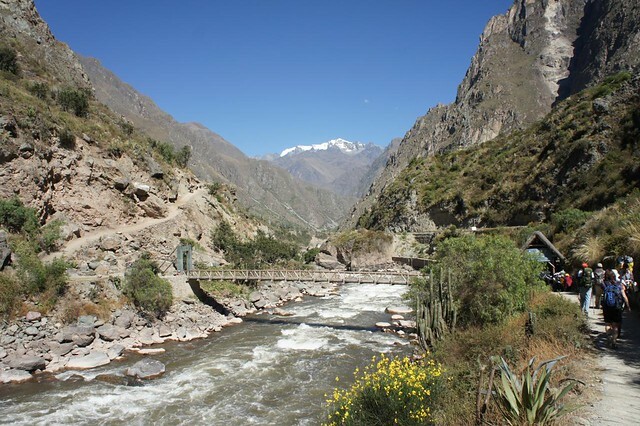 The Urubamba river roared beneath us and the snow-capped peaks formidable. Over the course of the next few days, I would never fail to be moved by the beauty of my surroundings. We headed onwards, with the inclines becoming steeper. As we trudged along, we were overtaken at a great pace by the porters carrying camping gear and supplies for the trekkers. One was balancing a dozen eggs at the top of his pack. They seemed to almost dance along, despite their heavy loads. I was also met by trekkers coming in the opposite direction. 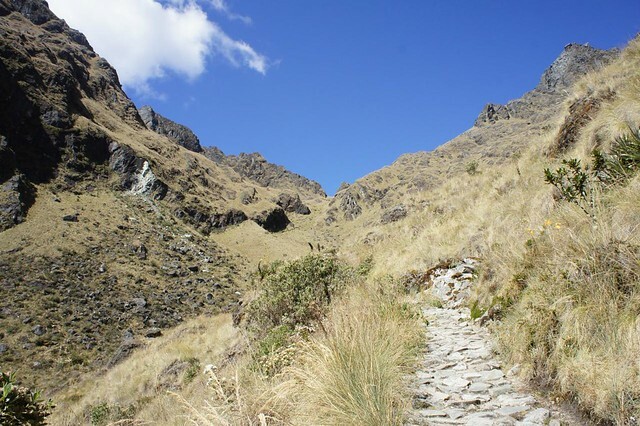 The Inca Trail is a one-way trip, but some people (usually those who haven't spent any time acclimatising) have to turn back early on due to altitude sickness. It was a sobering sight. I slowed my pace, took time to take lots of photos and determined to enjoy every moment. 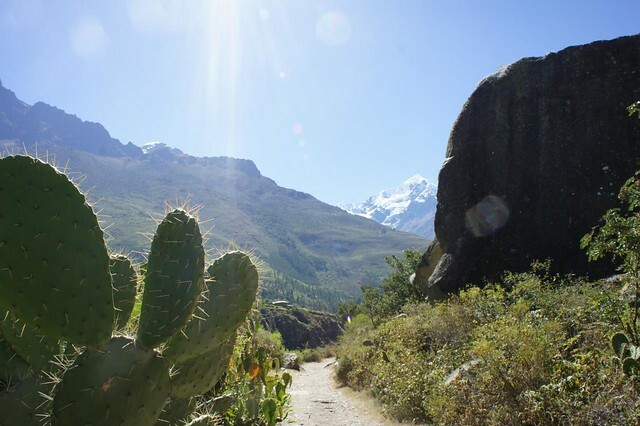 The second day of the trek is the one that people fear most as it involves climbing Dead Women's Pass and, more significantly, climbing to an altitude of 4,200. Even the porters slow down at this altitude. The group split up, everyone taking the trek at his or her own pace. Despite the fact that I had read accounts of the trail being busy and over-crowded, I barely saw anyone else during that day. I panted my way to the top, pausing along the way to admire the beautiful flowers and the magnificent views. Reaching the top of the pass was an incredible feeling. My sense of achievement was only over-ridden by the awe-inspiring setting. By the morning of Day 3, we were all very well acclimatised and the trekking felt much more manageable. Today we were to climb a further two passes, stopping along the way to explore Incan ruins. The ruins I saw were so beautifully preserved and in such a dramatic setting, it would be hard not to be bowled over by them. As someone raised in the West, where so much of our culture and history is well documented, it was fascinating to be somewhere where the entire theories of a civilisation were based on stories and hearsay. 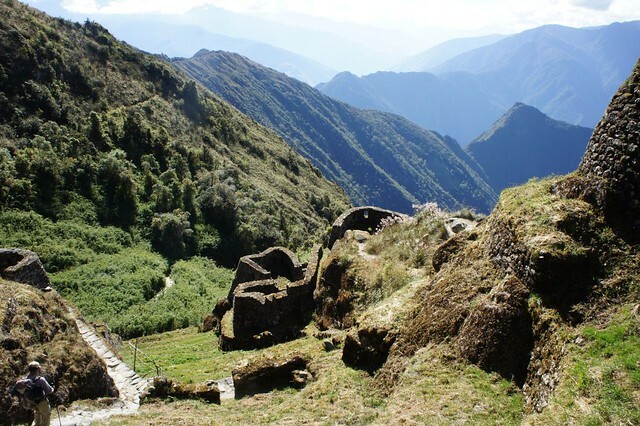 With no written word from the Incas themselves, all we know about them is what the Spanish conquistadores recorded and what has been passed down in story from for generations. I loved the fact that I was at liberty to devise my own theories about their heritage. I was now fully immersed in my trekking experience. The grotty squat toilets were no longer a problem and I wasn't craving a shower. As far as I was concerned, this trek could go on and on. The rest of the world felt a very long way away. The trekking was much easier going as well and as we started to descend towards our final campsite, I was filled with excitement about getting to Machu Picchu the next day. Another early start the next morning as we were aiming to arrive at the Sun Gate in time for the sunrise. We walked silently with head torches to show the way. This was the first time I became aware of quite how many other trekkers there were on the trail. I had seen other people at the campsites and along the way, but for the most part, when walking it had just been our group. Because everyone in the campsite heads off together on the final day of the trek, there were all of a sudden many more people around. It didn't feel like a jostle, though, more like a silent pilgrimage. After a 2 hour trek, we reached the sun gate and I found a quiet spot on a rock to watch the break of dawn. A feeling of immense elation washed over me as the sun rose from behind the mountains and the mist began to lift, revealing one of the most beautiful views of Machu Picchu. 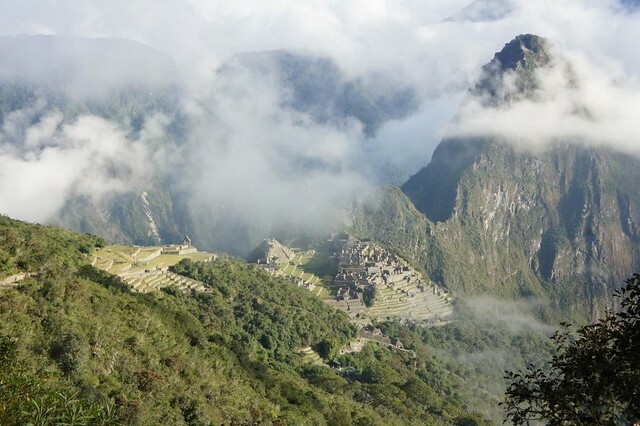 Seeing the wisps of cloud shrouding these ancient ruins the elation was impalpable, I had survived the Inca Trail and not only that I had really enjoyed myself.